The Best Recipe For Chocolate Chip Cookies To Call Your Own! All you need is one good Chocolate Chip Cookies Recipe to create a multitude of different cookies. This versatile Recipe for Chocolate Chip Cookies is a great example of what you can do with one great cookie recipe and a little sweet creativity! 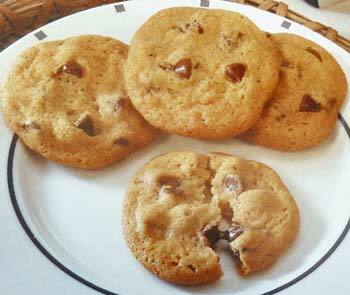 You can turn to these Chocolate Chip Cookies again and again, each time with a completely different result! You can store chocolate chip cookie dough in an airtight container in the refrigerator for up to 3 days or in the freezer for up to six months. Shape the cookie dough into 1-inch balls, freeze and then store in a zip-top plastic bag in the freezer or shape the dough into logs, wrap in parchment paper and place in zip-top plastic freezer bags for quick slice-and-bake cookies. You don't even need to thaw the frozen cookie dough balls or logs. Just remember that the frozen cookie dough will require two to three minutes of extra baking time. Preheat oven to 350F. Line baking sheets with parchment paper and set aside. In a small bowl, whisk together flour, baking soda, and salt until well combined; set aside. 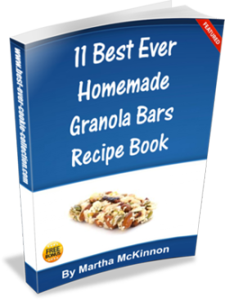 In a large bowl beat butter and sugars at medium speed with an electric mixer until creamy. Add eggs and vanilla and beat until well blended. Scrape down the sides of the bowl to make sure everything is well combined. Gradually add the flour mixture to the butter mixture, stirring just until combined. Stir in chocolate chips just until incorporated. Drop by tablespoonfuls onto lined baking sheets. Bake for 10 to 14 minutes or until desired degree of doneness. 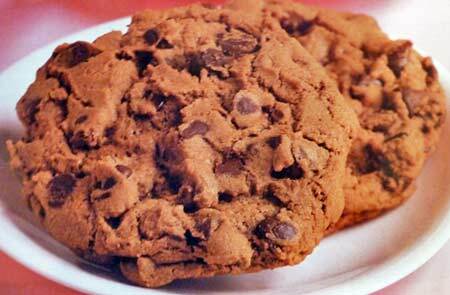 Bake about 10 minutes for soft chewy chocolate chip cookies and up to 14 minutes for crisp cookies. Remove from the oven and let cool 1 to 2 minutes and then transfer the cookies to wire racks to cool completely. This recipe yields about 5 dozen Chocolate Chip Cookies. Almond-Toffee Cookies: Substitute 6 (1.4) ounce chopped chocolate covered toffee candy bars and 1 1/2 cups toasted slivered almonds for the chocolate chips. Chocolate Chip-Pretzel Cookies: Stir in 2 cups crushed pretzels sticks with the chocolate chips. Cranberry-White Chocolate Chip Cookies: Substitute 2 cups white chocolate morsels, 1 cup dried cranberries, 1 cup pistachios for the chocolate chips. This makes a festive holiday cookies with shades of red and green. Double Chocolate Pecan Cookies: Stir in 2/3 cup unsweetened cocoa powder with the flour. Substitute 1 (10 ounce) bag English toffee bits, 1 1/2 cups coarsely chopped toasted pecans, and 2 (10 ounce) coarsely chopped milk chocolate bars for the chocolate chips. M&M Cookies: Substitute M&Ms for the chocolate chips. Nutty Peanut Butter-Chocolate Chip Cookies: Decrease salt to 1/2 teaspoon. Increase flour to 2 1/2 cups plus 2 tablespoons. Add 1 cup creamy peanut butter with butter and sugars. Decrease chocolate chips to 2 cups and add 1 cup lightly salted peanuts with the chocolate chips. The dough will be a little moist. Chill dough before baking for best results. Tropical White Chocolate Chip Cookies: Substitute 2 cups white chocolate chips, 1 cup coarsely chopped macadamia nuts, 1/2 cup chopped dried pineapple, 1/2 cup chopped dried mango and 1 tablespoon lime zest for the chocolate chips. Turtle Cookies: Substitute 1 cup milk chocolate caramel-pecan clusters, coarsely chopped, and 2 cups dark chocolate morsels for the semisweet chocolate morsels. This cookie is perfect to pack in lunch boxes and it also makes a great after school snack. Following this recipe will make crispy cookies, so if you prefer soft chocolate chip cookies, simply increase the oven temperature to 325F degrees and bake them for only about 20 minutes. These cookie treats keep well at room temperature when stored in an airtight container, and they may also be frozen in a tightly sealed container. Preheat oven to 300F. Line baking sheets with parchment paper and set aside. In a mixing bowl, beat butter and brown sugar on medium speed until soft. Add eggs, dark rum and vanilla and beat until well blended - scraping down the sides of the bowl as needed. Slowly add the sifted flour mixture and beat just until combined. Using two heaping tablespoons of dough (just shy of 3 ounces) for each cookie, drop dough onto lined baking sheets, spacing them at least 3 inches apart. Bake for 28 to 30 until dry to the touch (for crisp cookies) or bake about 20 minutes at 325F degrees for soft-baked cookies - remember to rotate the baking sheets 180 degrees halfway through baking time. 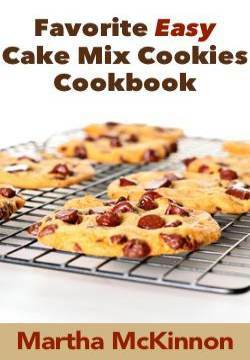 This recipe yields about 2 dozen 4-inch Grandma's Chocolate Chip Cookies. The Ghirardelli Chocolate Company is America's leading manufacturer for premium chocolate and the longest continuously operating chocolate manufacturer, since incorporating in 1852. This chocolate chip cookie recipe shows off the importance of chocolate flavor and how it is flavor that is the ultimate measure for quality in chocolate. Preheat oven to 375F. Line baking sheets with parchment paper and set aside. 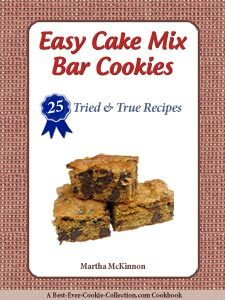 In a large mixing bowl with an electric mixer on medium speed, beat butter, white sugar and brown sugar until creamy, about 4 minutes. Add vanilla and eggs, one at a time, mixing on low speed until incorporated. Gradually blend the sifted flour mixture into the creamed mixture and beat just until combined. Stir in chocolate chips and nuts (if using). Drop dough by tablespoonful onto lined (or ungreased) baking sheets, about 2 inches apart. Bake for 9 to 11 minutes, until cookies are golden brown. Remove from the oven transfer cookies to wire racks to cool completely. Store cookies in airtight container at room temperature. This recipe yields about 48 Ghirardelli Chocolate Chip Cookies. Feel free to use your favorite Hershey's Baking Pieces in this recipe: milk chocolate, semi-sweet, special dark or premier white chocolate. Preheat oven to 350F. Line baking sheets with silicone liner or parchment paper and set aside. In a large mixing bowl, beat butter, brown sugar and granulated sugar until light and fluffy. Add corn syrup, egg and vanilla and beat well. In a medium bowl, stir together the flour, baking soda and salt. Gradually add dry flour mixture to the creamed mixture and beat until well blended. Drop dough by rounded teaspoons onto lined (or ungreased) baking sheets, at least 2 inches apart. Bake for 8 to 10 minutes or until lightly browned and almost set. Be careful not to overbake. Remove from the oven and let cookies sit on sheet for 1 minute before transferring to wire racks to cool completely. These cookies should be softer the second day. This recipe yields about 3 1/2 dozen Hershey's Soft and Chewy Chocolate Chip Cookies. Decrease flour to 2 1/4 cups and add 1/4 cup Hershey's Cocoa.